Known as the Golden Arrowhead, the Flag of Guyana predominantly features the colors green, gold, and red but also includes white and black. The name of the flag is derived from the red and gold horizontal triangles that enter from the right and form the shape of an arrowhead on a solid green background. 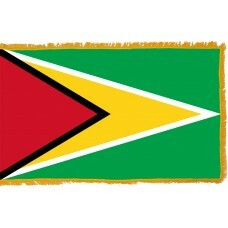 The black outline of the red triangle signifies the forward thrust and endurance of the Guyanese people and the white outlined gold triangle represents the waters of the country. The red color represents the zeal and dynamism of the young people building the country, green represents the forests and agricultural areas of Guyana, and gold represents the country's mineral wealth. 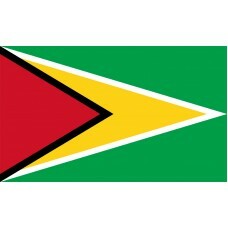 The flag was adopted in May 1966 when Guyana gained independence from the United Kingdom. The flag was not designed by a native of Guyana but by a professional flag scholar from the USA, Whitney Smith Junior. This country is situated on the northern mainland of South America but is more closely related through its culture and history with the nearby Caribbean. Prior to British rule it was originally settled by the Dutch but there is little evidence of this with the exception of some place names such as New Amsterdam and Stabroek Market and the introduction of dykes to the coastal areas to reduce flooding. The colonial buildings and political ideologies are derived from on British ideas. In fact, cricket is widely played and it is the only South American country that is a member of the Commonwealth of Nations and where English is the official language. Guyana, like it's neighbor Brazil to its south benefits from extensive rain forests with 80% covering the land and fortunately they remain relatively unspoiled and have avoided the exploitation which has occured in other parts of South America. The biodiversity held in these forests is some of the highest in the world with a vast collection of plants, (approximately 8,000 different species are found here), half of which are not found anywhere else in the world. The country is also home to over 1,168 different insect species and 814 bird species. Mammals such as the Jaguar, Saki monkeys, bush dogs, Taipir, and giant anteaters are also commonly found. Early explorers like Charles Waterton and Sir Walter Raleigh took time to note their findings here and in later years naturalists such as Gerald Durrell and David Attenborough came to check out the rich spoils that can be found in this wealth of greenery which is so aptly represented in the flag of Guyana. To help in the preservation of this incredible natural environment, in 1977, Guyana was the first Caribbean country to sign up to the Convention Concerning the Protection of the World Cultural and Natural Heritage treaty. The country has been working hard to earn UNESCO World Heritage nomination on sites such as the Kaieteur National Park which is home to the impressive Kaieteur Falls and combines with the Iwokrama Forest and the Kanuku Mountains as a cluster site.